Round Rock car door unlocking, Home or condo door unlocking, Commercial door unlocking service. Austin door unlocking and surrounding areas. Are your keys locked in car or your locked out of car and need help to get back in? We provide door unlocking for cars, homes, condos and all business doors with in the area. Emergency car unlocking for keys locked in car or truck we are the Round Rock emergency locksmith service to call for fast safe car opening and all your lock needs. 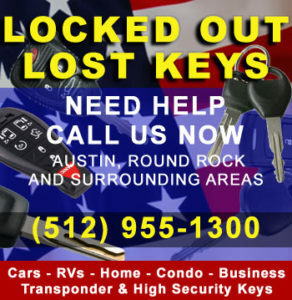 We are your Round Rock Emergency Locksmith Fast safe car opening. No harsh tools used that can scratch your car. We are a full-service Austin area locksmith. Need a locksmith in Round Rock TX we are here for you. Professional quality work done right and on time. After we unlock your car if your keys are not in the car and the keys are lost we can move on to making you new keys for your car and do all the programing for the new key if needed. We can make standard car keys, transponder car keys including key programing and the newer high security track keys and programing and remote head keys Fobik keys, Prox keys and more. We can make and program most all dealer keys for less then going to a car dealer saving you money and you do not need to have your car towed we come to you. FAST Door Unlocking of your Car, RV, Home or Business. We are a Austin area Round Rock Locksmith company if you are Locked Out Of Your Car or Need help Fast call Us. Call now for fast Emergency lockout service. We open cars safe and fast. We can pop a car open in no time and get you on your way. We also make and program Auto keys and make copys including Transponder keys, Remote head keys, Fobik keys and Prox keys.